Sirius XM Holdings Inc. (NASDAQ :SIRI ) and Pandora Media, Inc. (NYSE :P ) today announced a definitive agreement under which SiriusXM will acquire Pandora in an all-stock transaction valued at approximately $3.5 billion. The combination creates the world's largest audio entertainment company, with more than $7 billion in expected pro-forma revenue in 2018 and strong, long-term growth opportunities. This strategic transaction builds on SiriusXM's position as the leader in subscription radio and a critically-acclaimed curator of exclusive audio programming with the addition of the largest U.S. audio streaming platform. 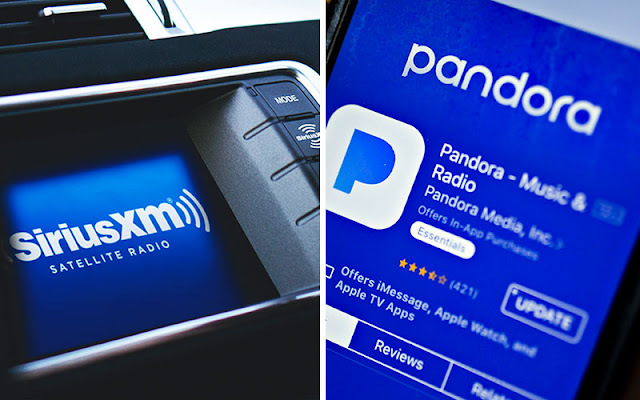 Pandora's powerful music platform will enable SiriusXM to significantly expand its presence beyond vehicles into the home and other mobile areas. Following the completion of the transaction, there will be no immediate change in listener offerings. Capitalizing on cross-promotion opportunities between SiriusXM's base of more than 36 million subscribers across North America and 23 million-plus annual trial listeners and Pandora's more than 70 million monthly active users, which represents the largest digital audio audience in the U.S.
Leveraging SiriusXM's exclusive content and programming with Pandora's ad-supported and subscription tiers to create unique audio packages, while also utilizing SiriusXM's extensive automotive relationships to drive Pandora's in-car distribution. Continuing investments in content, technology, innovation, and expanded monetization opportunities through both ad-supported and subscription services in and out of the vehicle. Supporting and strengthening Pandora's highly relevant brand. Creating a promotional platform for emerging and established artists, curated and personalized in ways to deliver the most compelling audio experience that connects artists to their fan bases, as well as new listeners. Jim Meyer, Chief Executive Officer of SiriusXM, said, "We have long respected Pandora and their team for their popular consumer offering that has attracted a massive audience, and have been impressed by Pandora's strategic progress and stronger execution. We believe there are significant opportunities to create value for both companies' stockholders by combining our complementary businesses. The addition of Pandora diversifies SiriusXM's revenue streams with the U.S.'s largest ad-supported audio offering, broadens our technical capabilities, and represents an exciting next step in our efforts to expand our reach out of the car even further. Through targeted investments, we see significant opportunities to drive innovation that will accelerate growth beyond what would be available to the separate companies, and does so in a way that also benefits consumers, artists, and the broader content communities. Together, we will deliver even more of the best content on radio to our passionate and loyal listeners, and attract new listeners, across our two platforms." Roger Lynch, Chief Executive Officer of Pandora, said, "We've made tremendous progress in our efforts to lead in digital audio. Together with SiriusXM, we're even better positioned to take advantage of the huge opportunities we see in audio entertainment, including growing our advertising business and expanding our subscription offerings. The powerful combination of SiriusXM's content, position in the car, and premium subscription products, along with the biggest audio streaming service in the U.S., will create the world's largest audio entertainment company. This transaction will deliver significant value to our stockholders and will allow them to participate in upside, given SiriusXM's strong brand, financial resources and track record delivering results."